We are spending Valentines day with a foodie friend and her family. I can't wait! She always makes the most delicious food. I am in charge of the desserts. In preparation I have been testing recipes and I had to share this one. It is so easy and fast, it would be great for a little candlelight dinner for two. (Or for a Valentines girls night out.) I found the recipe in Everyday Food, but I changed things up a bit to make it even more decadent. Fold the edges up to create a crust and poke holes in the center with a fork. 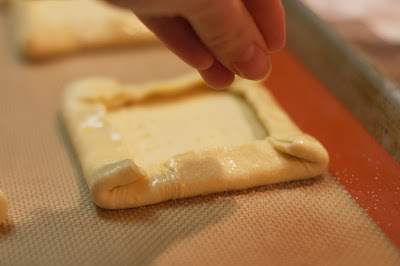 Brush edges of pastry with egg wash and sprinkle with sugar. 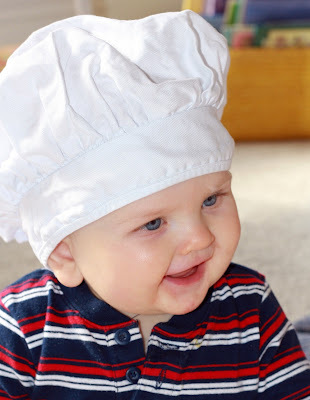 Freeze for 15 minutes and then bake for 15 - 20 minutes until puffed and golden brown. The original recipe calls for melted chocolate as base. makes it into the most delectable ganache. A ganache won't harden, so it is a better choice if you are going to serve the pastry with ice cream or gelato. 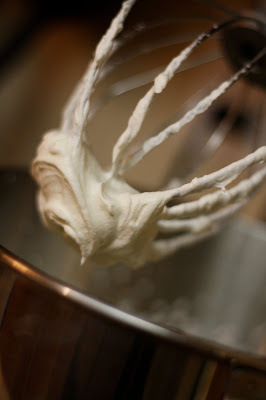 Whip the rest of your cream with sugar and vanilla. Toast almonds until they are fragrant. Watch them! Mine seem to burn the moment I step away. Oops! I guess I should have pierced the dough a little more. No worries. If this happens to you, poke the pastry in the middle so it falls. 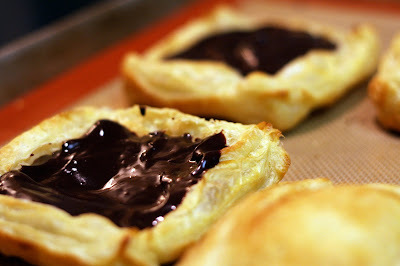 Spread the ganache onto the pastry. 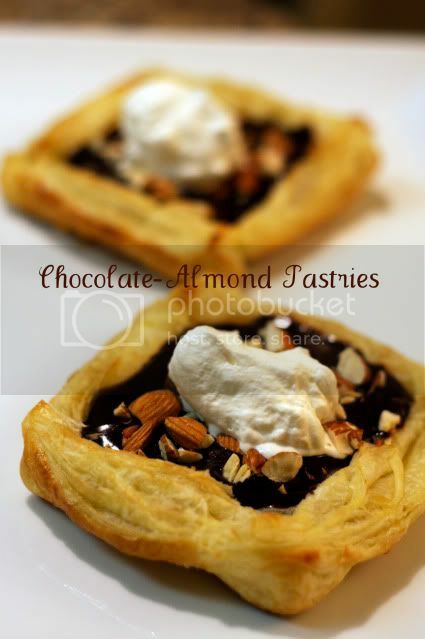 Top with almonds and a dollop of whipped cream. Drizzle with honey to make it extra special. Serve with vanilla ice cream or pistachio gelato. 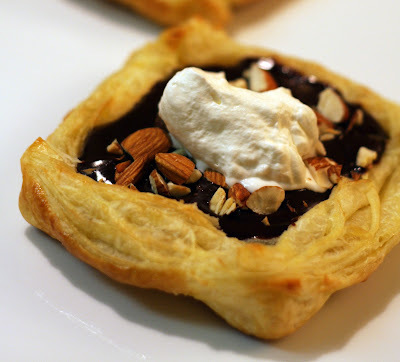 By the way - have extra ganache and whipped cream? Gently fold the chocolate into the cream and you get the easiest chocolate mousse. Great dessert for kids. 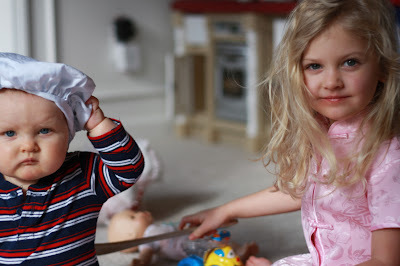 Thanks for the help little chefs! Wow! I have been posting a lot lately. Seriously, I will not be clogging up your reader like this too much longer. I just really like holidays. Nat, you are getting very good as using your camera. Your photos are delicious! This will be made in my house. Tomorrow. Or tonight. It looks too good! Lydia looks so grown and gorgeous in that picture. Mmmmm these look divine!! Dang--i want to try one!